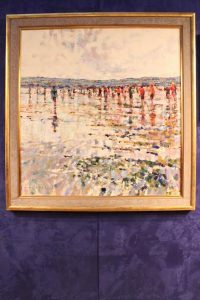 A Lavery portrait and a painting of the Cork quays by Norman McCaig (1929-2001) are among the prime lots at Hegarty’s west Cork country house auction in Bandon on January 27. 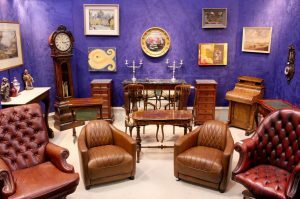 The auction will bring two family collections to market, from Lawn House and the Barber family, and will offer furniture, fine art, silver and jewellery. 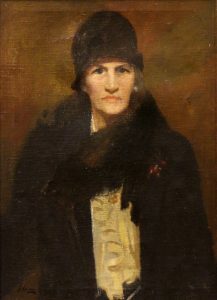 A portrait of Mrs. Gertrude Coutts by Sir John Lavery (1856-1941) is stamped “B. Kellerman Painters Supplies, New York”. It measures 28′ x 20′ and is estimated at 4,000-8,000. 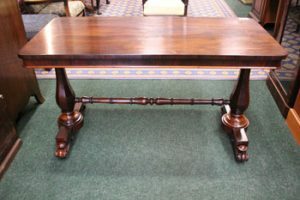 Among the furniture is a pair of Irish rosewood fold over card tables c1820 and an 18th century Irish mahogany hunt table. 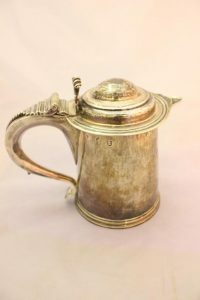 There is an early 20th century Arts and Crafts silver goblet and a collection of jewellery. 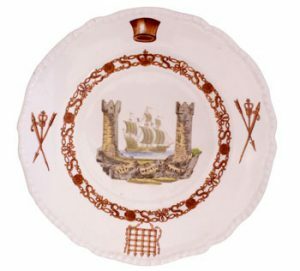 A possible memento of the first crossing of the Atlantic by steamship comes up at Hegarty’s sale in Bandon tomorrow afternoon. Lot 184 is an iron bound wooden coffer or seaman’s chest with rope handles believed to have been on The Sirius which completed the first steamship crossing in New York on April 10, 1838. SS Sirius, built in 1837 for the London Cork route by the Saint George Steam Packet Company, was captained by Richard Roberts of Passage West, Cork. The next year she was chartered by the British and American Steam Navigation Company for two voyages to the US. 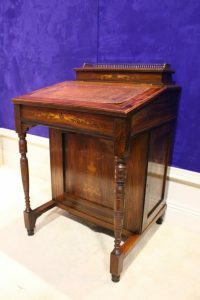 Hegarty’s sale includes contents from Simla, a 19th century house overlooking the sea in Passage West, which was home to the Roberts family for almost 100 years. One of the main rooms in the sale. 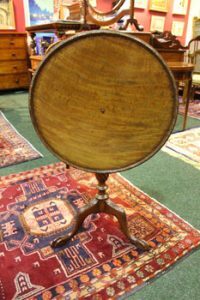 An 18th century Irish half moon side table in the manner of William Moore will be a furniture highlight at Hegarty’s evening sale in Bandon, Co. Cork on May 9. The 300 lot auction will feature contents from The Glebe House at Nohoval which dates to 1816. 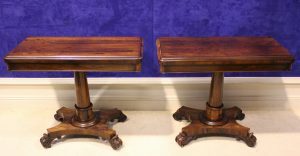 A pair of c1810 Regency Irish card tables is another highlight. Both lots are estimated at 6,000-10,000. An early Victorian long case clock is labelled Patterson of Fermy and is estimated at 2,000-4,000. 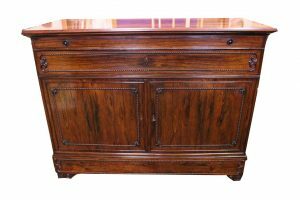 There is some English oak furniture including a Queen Anne Welsh dresser (500-1,000), a large hall bench (500-1,000) and a Jacobean style mirror backed pedestal sideboard (500-1,000). Collectibles include a lady’s silver vanity set with Birmingham marks to around 1899-1900. 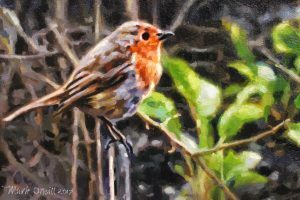 Artists in the sale include Martin Finnin, Graham Knuttel and Arthur Maderson. 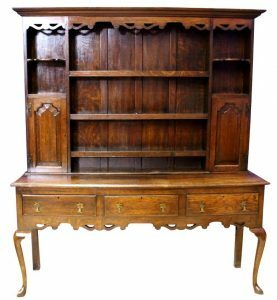 A Queen Anne Welsh dresser. 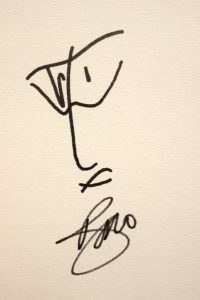 THE SELF PORTRAIT BY BONO. A Bono self portrait sketch comes up at Hegarty’s sale in Bandon next Sunday. The sketch by the globally known lead singer with U2, songwriter, venture capitalist and philanthropist is situated in a most un rockstar like position on the catalogue between a tall glass cabinet with gilt wood decoration and a large chesterfield leather sofa. Lot 29 in a sale due to start at 4 p.m. is a pen sketch signed in the centre by Paul “Bono” Hewson. 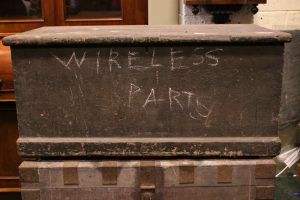 It measures 17″ x 13.75″ approximately. Dated 2007, it comes complete with a certificate of authenticity. 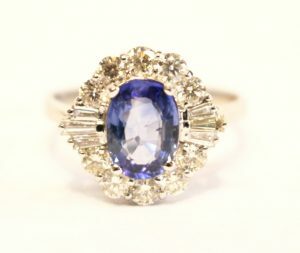 More than 300 lots will come under the hammer. 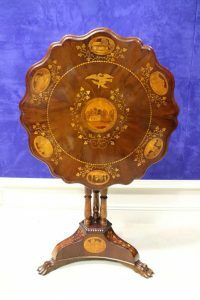 Contents from Glebe House, Lisheen, Skibbereen, Co. Cork – former home of departed AIB chief David Duffy – will feature at Hegarty’s sale in Bandon on April 9. 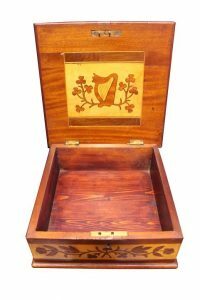 Prime lots include a Killarney wood tip up centre table inlaid with a view of Muckross Abbey and decorated with shamrock and other local views. It is estimated at 10,000-20,000. 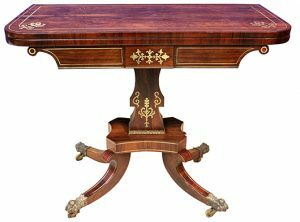 There is an Irish Regency fold over card table (2,500-3,500), an Edwardian walnut and ebonised credenza (1,000-2,000), a Cork Regency Nelson sideboard (300-500), a French gilt wood pier mirror (1,500-2,500) and a pair of Art Deco style aviation armchairs (1,200-1,800). 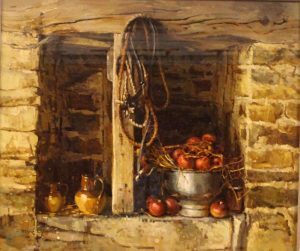 Among the artists who feature are Arthur Maderson, Peter Copperwhite, Markey Robinson and Marie Carroll and collectibles include a snuff bottle and a bronze 19th century Tibetan figure. 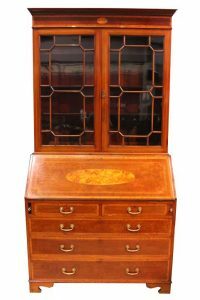 Around 300 lots will come under the hammer. 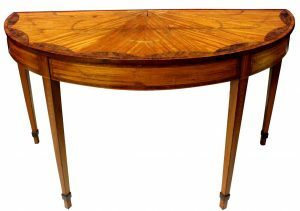 A tip up Killarney wood centre table (10,000-20,000) UPDATE: THIS MADE 11,000 AT HAMMER. 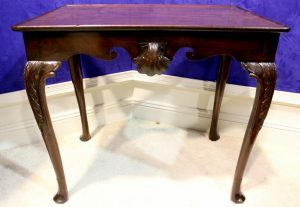 A Regency fold over card table (2,500-3,500). UPDATE: THIS MADE 2,150 AT HAMMER. 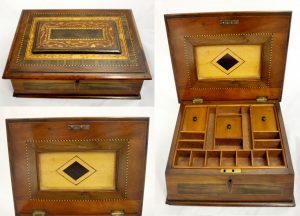 Antique furniture and a Killarney wood jewellery box are feature items at Hegarty’s first sale of 2017 in Bandon on January 26 at 7 p.m. A c1850 Irish silver table with shell motif is at 6,000-10,000 the most expensively estimated lot in the auction. 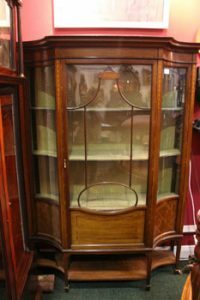 Among the other top lots are a Regency circular drum table (3,000-5,000), a 19th century gilt wood pier glass (2,000-3,000), a pair of William IV brass inlaid bookcases (2,000-3,000) and an early 19th century rosewood fold over card table (1,200-1,800). “Crossing the Cunnigar, Low Tide, Evening, Dungarvan”. 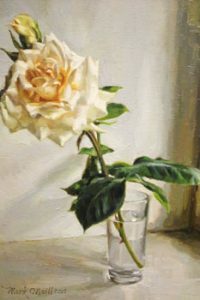 UPDATE: THIS WORK WAS UNDER NEGOTIATION AFTER THE AUCTION.